Our orthodontist in Elma, NY, Williamsville, NY and Orchard Park, NY, Dr. Jauch (also known as “Dr. J.”) is thrilled to be practicing dentistry in his hometown community. In fact, he comes from a long line in a local family of dentists, and attended area elementary and high schools. Dr. Jauch currently lives in Orchard Park, NY, where he and his wife, Heide, are raising their three children. In his leisure time, Dr. Jauch enjoys fishing on the Finger Lakes, camping and hiking in the Adirondacks with his family, or spending time on one of the area’s local golf courses. When the snow flies, however, he spends as much time as possible on the slopes at the Buffalo Ski Club. Dr. Jauch brings his extensive background, training, and commitment to excellence to More Than a Smile. He pursued both his undergraduate and doctoral degrees in dentistry from the University of Buffalo, and went on to Jacksonville University to earn his advanced Orthodontic specialty degree. While there, he also earned a prestigious award for “Exceptional Contributions to the Study of Oro-Facial Complex.” Dr. Jauch is board certified by the American Board of Orthodontics. Dr. Jauch is the past president of both the Eighth District Orthodontic Academy and Greater Buffalo Association of Orthodontists. He is also active in all local and national dental organizations, including the American Association of Orthodontists, the American Dental Association, the New York State Dental Association, the Northeastern Society of Orthodontists, and the Erie County Dental Society. Dr. Jauch is an active member of the Knights of Columbus and the Orchard Park Chamber of Commerce. 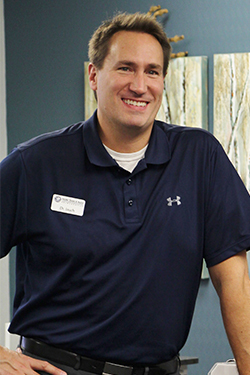 He is also tirelessly involved in many of the numerous community civic and non-profit organizations, schools, and youth sports teams supported by More Than a Smile Orthodontics. Schedule an Appointment with Our Orthodontist in Elma, NY, Williamsville, NY & Orchard Park, NY, Today! For an appointment at one of our 5-star-rated orthodontic offices in Elma, NY, Williamsville, NY or Orchard Park, NY, call 716.633.4747 or click here to use our convenient online appointment request form. We look forward to helping you achieve your best smile!